In my introduction to this series of myfastestmile posts on ‘innovation’, I used an ancient Greek story (Aesop’s fable of the golden goose) to illustrate one perspective on a word that’s often abused in sport (and beyond). The ancient Greek theme continues here as I explore the importance of scrutinising the true intent of those promoting ‘innovation’. In Virgil’s epic poem Aeneid, a Greek army leaves an unexpected and lavish gift as they apparently retreat from their 10-year siege of the fortress city of Troy. 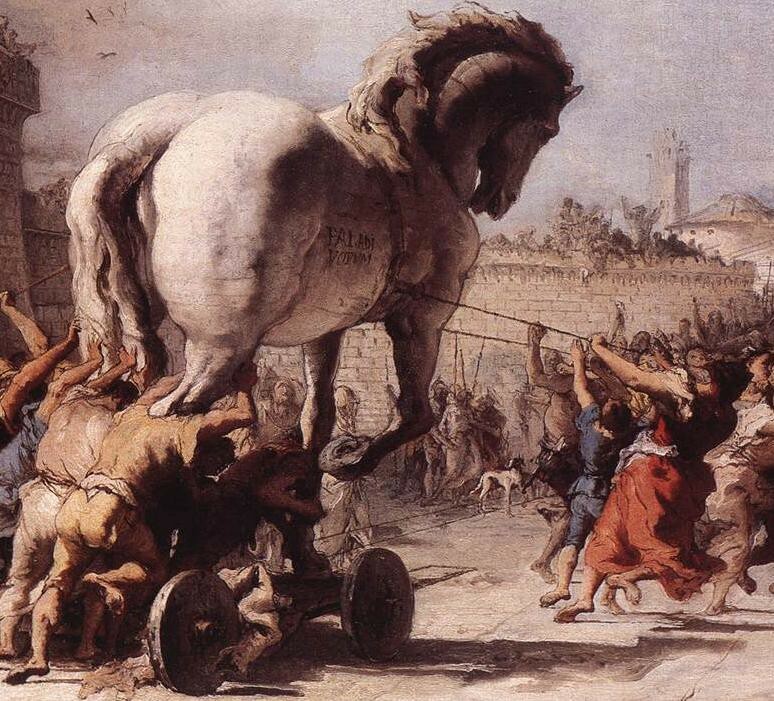 Intrigued by the giant wooden horse left behind by their enemies, the Trojans are taken in by claims of its purpose from the sham Greek deserter Sinon. Ignoring the loud protests of a wise old priest Laocoön, the war-weary Trojans fatefully welcome the ‘prize’ into their fortress. Later that night, as Troy sleeps, the true purpose of the wooden horse is revealed after its hidden cargo of Greek soldiers seize the city’s main gatehouse. The subsequent return of the supposedly ‘retreating’ Greek army seals the fate of Troy, as its hapless citizens are brutally slaughtered or enslaved. While some (perhaps misguidedly) advocate the vigorous pursuit of “new ways of doing things and new things to do” as a basis for re-imagining society itself, I focus on exploring the intent that drives leaders when they call for ‘innovation’. In The Innovator’s Solution, Clayton Christensen argues that leaders seek ‘innovation’ to ward off the threat of organisational stagnation and decay. Interestingly, however, a majority of surveyed business leaders express little confidence in the ability of their organisations to innovate. Such fears for the prospects of ‘innovation’ efforts are well founded. Eric von Hippel’s excellent 2005 book Democratising Innovation quotes several sources reporting an average 25–30% success rate. My own experience in running the Ministry of Defence Centre for Defence Enterprise (a circa £11M p.a. research and development fund) produced similar outcomes. My next post in this series will review, in detail, the root causes of the typical 70% failure rate for ‘innovation’ activity. The culture of an organisation is most readily experienced by observing its customs/practices and the behaviours of its people. Customs and practices (and the behaviours they produce) are a product of the organisation’s true purpose and the way its leaders see the world (their perspective). While published ‘vision’ and ‘mission’ statements are commonplace (in business and sport), something fundamental is missing. An organisation’s true purpose and the perspective of its leaders are both inevitably defined by a set of assumptions. Assumptions comprise beliefs about how the world works, an organisation’s place in that world, and its relationships with the people and things in it. The interaction of these assumptions becomes the reality that an organisation defines for itself. To take a real world example from sport, consider the current crop of appeals by British sports facing 100% cuts to their funding from the government agency UK Sport. I count myself lucky to have been skilfully mentored as a young scientist to always test assumptions against evidence. do citizens fully support prioritising funding toward the goal of winning Olympic and Paralympic medals? what evidence underpins UK Sport’s confidence in its ability to predict the sports that will and won’t succeed at future Olympic and Paralympic Games? do citizens put equal value on, for example, Mo Farah’s historic Olympic distance running ‘double double’ as they do on 2 gold medals won in Equestrian events? are citizens ‘inspired’ by Olympic and Paralympic medals? Is there a linear relationship of more medals = more inspiration? The above statement is (as announced yesterday) official British government policy. Making such sentiment real for citizens will, of course, require ‘innovation’ in models of leadership across many government agencies. Returning to the ancient story of the fall of Troy, there are some powerful lessons to be learned from the victorious Greeks and the slaughtered Trojans. The Greek Generals created a space for ‘innovation’ by being open to the evidence that their decade long siege was merely a waste of resources. Being open to that assumption paved the way for creative experimentation. Wisely, the Greeks devised a minimal cost experiment. If the ruse of the wooden horse failed, their net loss would’ve been some timber and a handful of captured soldiers. Having shut down the only dissenting voice, the Trojan leaders eliminated any space for both surfacing and testing their critical hidden assumptions. In contrast to their enemies, the Trojans’ conducted an experiment of incalculable cost. By willingly dragging the wooden horse into their city stronghold, they inadvertently sowed the seeds of their own destruction. In the next instalment of this series, I’ll provide insights that may help you to avoid committing Trojan style mistakes. Join me as we continue exploring wiser paths towards “new ways of doing things and new things to do”.